Frances O'Rourke, an expat from New Zealand, is a long-standing volunteer with Shanghai Sunrise, a charity program helping students from local underprivileged families. 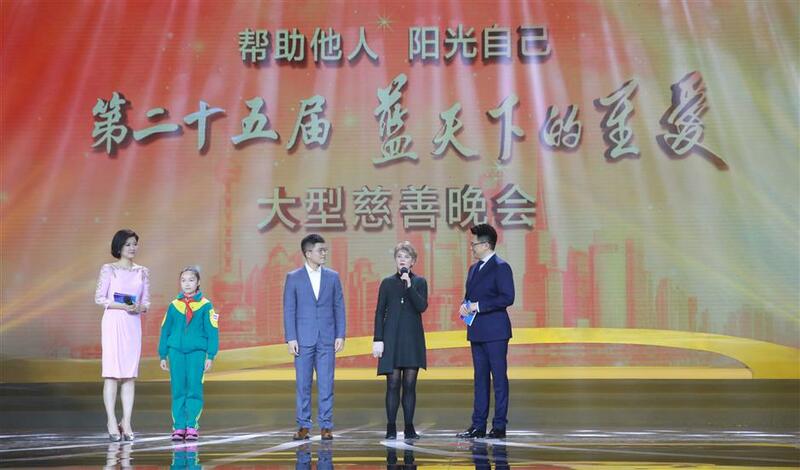 Frances O’Rourke (second from right) talks about her involvement with Shanghai Sunrise, a local charity program helping students from local underprivileged families, on a TV program on the night of January 12. Frances O’Rourke, a New Zealander, opened her heart on a TV fundraiser at the weekend. At home here for 14 years, O’Rourke has worked with Shanghai Sunrise, a charity program that has sponsored high school and university students since 1996, since she first arrived. “When I was younger, my family’s situation was not so good, and as I got older and I received help from many people, I wanted to give something back,” she said on the TV show, a culmination of the year-end of charity campaign, the Greatest Love Under the Sky. In a separate interview, O’Rourke told Shanghai Daily more about her engagement with the cause. In 2005, she was searching for Christmas cards and Shanghai Sunrise happened to be selling them to raise money for students. In the past 12 years, she has contributed about 200,000 yuan (US$29,600) to students through sponsorships and donations. Those who receive help stay in touch with their benefactors by writing letters and attending events. They also get opportunities to intern at companies the donors work for. Many graduates return to sponsor other young people themselves. “Paying back or paying forward is a really nice thing about the program. Together, through philanthropy, we’re changing people’s lives,” she said. Zhao Yi, director of the program, told Shanghai Daily that over 3 million yuan has been raised and benefited over 2,500 students. In the current school year, about 240 high school students and 150 university students are on the program. Basic sponsorship per school year for a high school student is 3,000 yuan and for a university student 6,000 yuan. Expats contribute the most money to the program and make up of over half of the active volunteers. Most students live in suburban districts. “The students who receive help are those from families with jobless parents or on minimum wage,” Zhao said. The city’s minimum wage was 2,420 yuan a month last year. The students and families in need apply for sponsorship through the Shanghai Charity Foundation’s district branches, and volunteers come to each applicant’s home to check up. Volunteers visit 100 to 150 families every year. Zhao said the program is helpful not just in the economic sense.